*Conditions Apply: Prices are per person, capacity controlled and listed in Australian dollars twin share including port taxes. Prices may fluctuate if surcharges, fees, taxes or currency change, and may be withdrawn at any time. Prices shown here are not shown in real time. While we endeavour to keep our pricing as up-to-date as possible, the advertised prices shown here may differ from the live prices in our booking system. The prices shown are for a cash payment. Credit card fees of up to 2.5% will apply. Offer correct as at 15Mar19 and subject to live availability at time of booking. Prices are per person twin share based on best available cruise fare, inclusive of all discounts unless otherwise stated. All offers are capacity controlled and can be withdrawn or modified at any time without notice and subject to availability at time of booking. All passports, vaccinations and visas are the responsibility of the travelling guest to secure prior to departure from Australia. Cruise deposit, amendment and cancellation conditions apply. Travel agent service fees not included. Prices do not include airfares, transfers, or hotel accommodation. ^Drinks on board do not include Champagne and wines on the exclusive wine list. Special conditions apply - please ask for full details at time of enquiry. Offer ends 26Apr19 or until sold out/withdrawn from sale. This cruise offer is provided by Cruise Abroad, please ask your travel agent to contact us for more information. 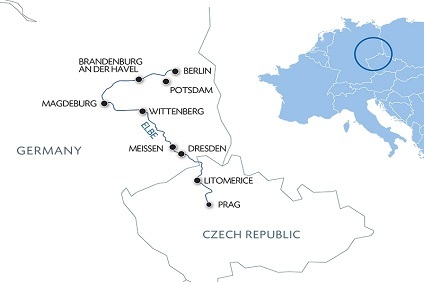 8 Night Cruise sailing from Prague to Berlin aboard Elbe Princesse. Prague, located on the Vltava River, is one of the most stunning cities in Europe, a UNESCO World Heritage listed gem, known as the ‘City of a Thousand Spires’. It is one of the least "eastern" European cities, with six hundred years of architecture untouched by natural disaster or war. Amongst Prague’s extensive array of historic and beautiful structures is Prague Castle and St. Vitus Cathedral, a gothic style cathedral with underground tombs. Both sights offer incredible views. The 700 year Old Town Square, is at the throbbing heart of tourist Prague and contains the Old Town Hall Tower and several impressive churches. Charles Bridge links the Lesser Town and the Castle above with the Old and New Towns. One of the most enjoyable aspects of visiting Prague is that much of the compact old core is accessible on foot, with plenty of bars and cafes and an excellent public transport system. Prague is also unquestionably a musical city. Prague Spring Festival is one of the major world-class festivals but concerts abound throughout the year. Buskers are found everywhere and the streets, squares and bridges echo to everything from talented students from the Conservatoire, to Dixieland jazz, folk and world music and pop. Bad Schandau is known as the oldest spa town in Saxon "Toskana Therme" is very popular, the thermal spa that was reconstructed after the floods. Right behind the spa promenade you can get to romantic valley of the stream Kirnitzsch from where the historical Kirnitzsch Valley electric railway departs in regular intervals. In the centre you can visit a botanical garden, a museum, a church or take the Bad Schandau Elevator up above Bad Schandau. Wittenberg, officially Lutherstadt Wittenberg, is a town in Germany in the Bundesland Saxony-Anhalt, on the Elbe River. It is best known as the home of Martin Luther and the birthplace of the Protestant Reformation. Attractions in Wittenberg include the houses where Martin Luther, Philip Melanchton, and Lukas Cranach lived and worked, the Schlosskirche where Luther supposedly nailed his 95 Theses to the door, the castle, as well as the pretty old town. The main tourist sights are all along CollegienstraBe, which leads uphill through the old town before changing into Schlossstraße after the Market Square. Magdeburg is the capital city of the Bundesland of Saxony-Anhalt, Germany. It lies on the Elbe River and was one of the most important medieval cities of Europe. The 1200 year old capital city has a rich and colourful past, but is also a modern and thriving metropolis with many beautiful sights and attractions. Magdeburg Cathedral and the Monastery of Our Lady are among the many historically important buildings highlighting a wealth of cultural attractions. New buildings such as the Waterway Junction and the Hundertwasserhaus have become further architectural gems in the crown of the capital city.